Could anyone do a quick verbal brief on what a normal takeoff and landing are like in an 8? I just finished a fresh tailwheel endorsement in an Aeronca Champ - 90% on a grass runway, and am looking for transition training this summer before I finish construction. I did some flying of a Citabria many years ago off of hard surface and I'm sure that was a bit closer to RV performance. I'm located near Cincinnati if you know of a good instructor in the area. I have no experience in a Champ, but I think it's safe to say that transition training in an RV would be strongly suggested, especially on hard surface runways. Takeoff isn't the issue, but it does happen fast and because of the horsepower, there can be noticeable P factor and left turning tendencies. An -8 will get up and go and you need to be ready for it. Landings of course are a challenge. 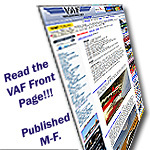 Read http://www.vansairforce.com/communit...ad.php?t=16788 for more info. Suffice it to say that the stiff legs on the RV-8 will bounce you back into the air with the slightest error. Three point landings can be made, but they are difficult and you have to have your airspeed control and timing just right. This is why most wheel land their -8s. I wouldn't assume that Champ training makes you ready for an -8 or anything other RV, and I'd strongly suggest transition training. I have flown both and second Mark's comments above.. I actually have never experienced an RV takeoff since I shut my eyes tight and then firewall it. Like others said, takeoff happens fast. It's kind of hard to screw up, just watch the torque. Although I guess anything is possible, I can't imagine departure stalling one of these. Landing happens fast too. Your pattern speeds will be higher than Champ cruise speeds. You'll need to plan ahead to slow down and fly a larger pattern. Ours has a constant speed and on landing it can develop a pretty high sink rate so plan on carrying some power. With the Hershey bar wing it does not float. I chop the power, flare, and am on the ground about that fast. Solo with 20-30 lbs in the back ours is a pooch to fly. With a full size adult back there it's a whole other animal. Not harder, just different. The RV-Grin is still on my face and the training was very very valuable! I found a 100 hp Champ to be a good trainer for the RV7. Maybe just me, but I was more comfortable in the RV after getting my tailwheel endorsement in the Champ. If you can nail the approach speeds, rotate and land with little bounce in the Champ, then you won't have any problem moving to the RV, if your experience is like mine. Yes, it is way faster, and more P factor, but nailing the landing speeds and getting the vertical speed right at touchdown was extremely helpful in the Champ. Not at all to say transition training is not needed, but your first hours in the RV should come much easier with the Champ skills. At least if you are a low time TW pilot to start with. Thanks for all your comments! Thanks Mark for the link! How did I miss that page!? One of the strange things to me about the Champ takeoff (grass) was holding the stick full forward for several seconds until the tail came up - mentally a challenge / counterintuitive to try forcing the nose down during takeoff From that, I was imagining starting takeoff with stick full aft in the 8 for a couple of "bananas" for directional control until the rudder works, then lifting the tail. Sounds like the bananas slip by pretty fast. Landings were almost all full stall in the Champ, wheel landings were tricky and discouraged by the management and instructors. Really looking forward to some training in the 8 and flying!